Mom with a Dandelion in Her Hair: What Comes First? The Chicken or the Egg? I have to say, I never thought much about patterns and why they are taught to young children. Now though, as I see my older boys progress through 1st grade math, I keep seeing patterns pop up. I actually don't see them as much as my 6 year old sees them. He is wired to see patterns and points them out to me. Whether it's when we are skip counting or simply working through our math worksheet and he sees two of the same number. The activity from Mother Goose Time I am going to discuss here today was on "Hatchling" day, Day 3 of the Birds & Eggs theme. 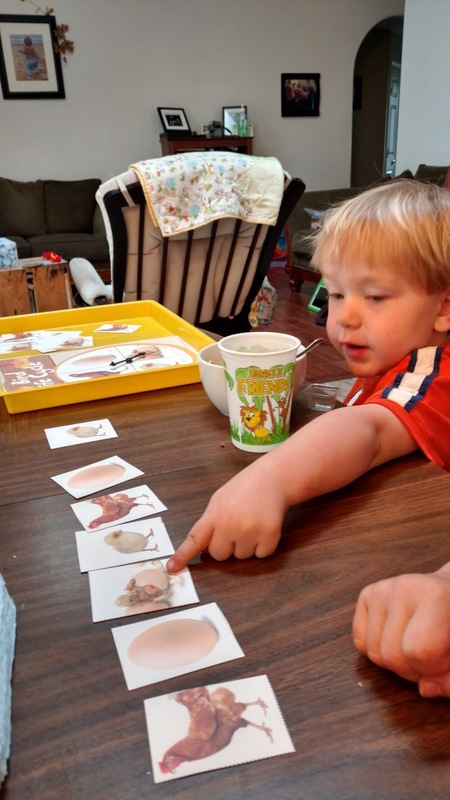 The activity was called Bird Life Cycle and it included a life cycle card with a spinner, and life cycle cards. 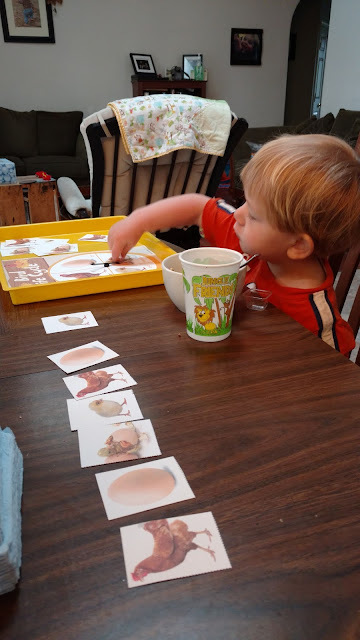 It was a great activity to help my 3 year old, Adam, learn to recognize patterns. Not only that, I felt it was a great introduction to the great philosophical question of "what comes first? The chicken or the egg?" As is common around here, he was doing this activity over breakfast. I set out the life cycle cards on the tray, he would spin the spinner, grab the card and lay it on the table next to him. As he did this, his big brother helped him put them in order. There was some debate over whether the egg should start the pattern or the chicken. All of Mother Goose Time's activities have numbers listed just under their title. These numbers tell us what skill and goal the activity is focusing on. On this activity the number 18.1 was listed. I am able to quickly take a look at the Developmental Continuum to find out that the skill and specific goal in focus is the child's ability to Identify and Create Patterns. 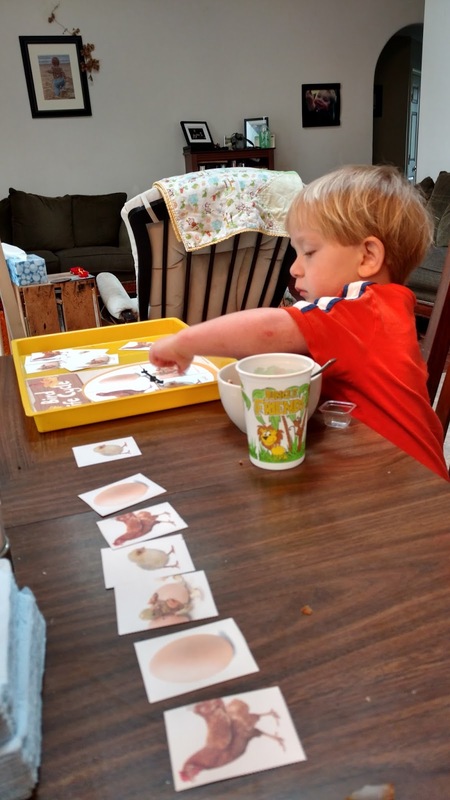 I am fortunate enough to have a copy of the Research Foundation book from Experience Early Learning, the company that makes Mother Goose Time. I love having this tool, probably because of my psychology degree and having a real desire to understand why we do things the way we do. This particular patterning activity was neat because it was more like a game. Also, they didn't have a pattern they were copying at first but doing a little life science to figure out what order things could go in. And, all jokes aside, it had some flexibility in it's pattern because you could start with an egg and show how a chicken develops from there or start with a chicken and show how it lays and egg and develops from there. After seeing how patterns pop up in more advanced math with my older boys, it really has motivated me to not gloss over patterns with Adam. They really are important, and as always with Mother Goose Time, they are also fun! I realized when I was homeschooling our foster daughters just how important pattern recognition is. Two of the girls really struggled math and even reading because they didn't seem to identify or repeat patterns effectively. It really motivated me to focus on patterns with Little Guy.